RePub, Erasmus University Repository: What's the value of being different when everyone is? What's the value of being different when everyone is? Is moderate distinctiveness optimal for performance? Answers to this question have been mixed, with both inverted U‐ and U‐shaped relationships being argued for and found in the literature. I show how nearly identical mechanisms driving the distinctiveness‐performance relationship can yield both U‐ and inverted U‐shaped effects due to differences in relative strength, rather than their countervailing nature. 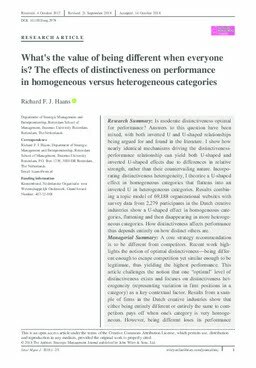 Incorporating distinctiveness heterogeneity, I theorize a U‐shaped effect in homogeneous categories that flattens into an inverted U in heterogeneous categories. Results combining a topic model of 69,188 organizational websites with survey data from 2,279 participants in the Dutch creative industries show a U‐shaped effect in homogeneous categories, flattening and then disappearing in more heterogeneous categories. How distinctiveness affects performance thus depends entirely on how distinct others are.